For the past two years, a growing number of USC Thornton students and alumni have found an unexpected musical haven in a Westside Los Angeles home. 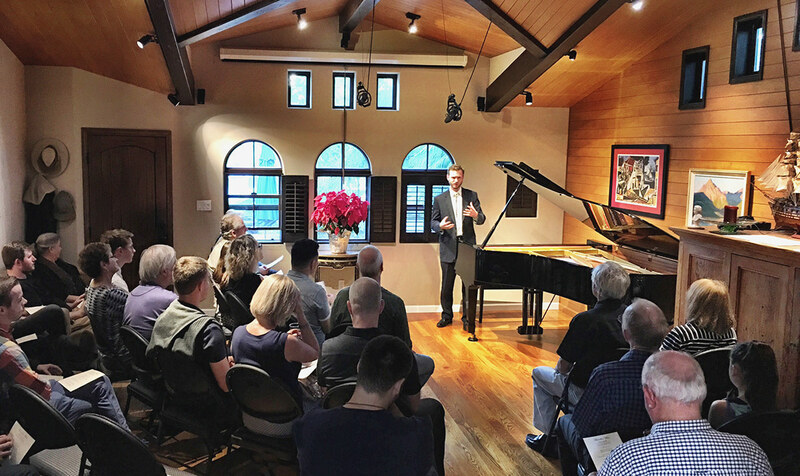 The space belongs to composer Todd Mason, who, together with his wife, remodeled their house to create an intimate performance venue for chamber musicians and audiences. The residence now hosts a regular performance series, called Mason Home Concerts, which welcomes Thornton artists. Mason’s project continues a vital Los Angeles tradition of chamber music concerts in private residences, from the seminal Evenings on the Roof concerts of the 1940’s through the Da Camera Society’s performances in iconic historical homes, a pioneering series founded by esteemed alumna MaryAnn Bonino. What sets the Mason Home Concerts apart is their extraordinary intimacy, with an audience capacity of around 50, and their emphasis on Thornton musicians. Although he studied at Juilliard, Mason’s first composition teacher was Marienne Uszler, long-time professor of Piano Pedagogy at Thornton. But it wasn’t until he premiered one of his own compositions with the Argus Quartet, which includes Thornton alumni Jason Issokson (MM’10, violin), Clara Kim (DMA ’15, violin), and Diana Wade (GCRT ’13, viola), that Mason became closely acquainted with the Thornton community. 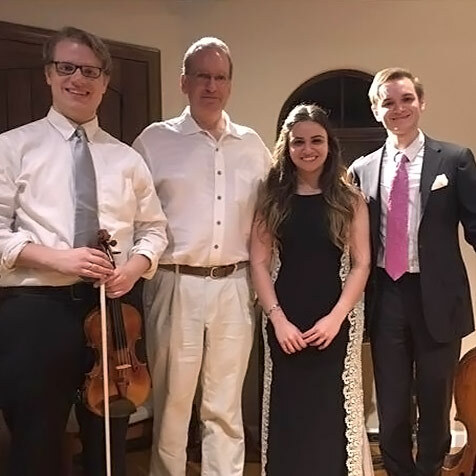 Since the series first launched in 2015, Mason has hosted concerts featuring the Argus Quartet, horn player Allen Fogle, composer and faculty member Sean Friar, cellists Coleman Itzkoff (MM ’16) and Michael Kaufman (DMA, ’14), violinist Philip Marten, pianist and DMA candidate Alin Melik-Adamyan (’12, MM ’14), composer Daniel Silliman (’15), and pianist Brendan White, among many others. His friendship with clarinetist and GCRT candidate Benjamin Mitchell, founder of the Kaleidoscope Chamber Orchestra, has blossomed into an ongoing collaboration with the thriving ensemble, which Mason helps to support and promote. In addition to the traditional chamber repertoire of Bach, Beethoven, Mozart, Mendelssohn, and Brahms, Mason regularly programs new music and even world premieres. His intimate, acoustically-treated venue boasts a concert grand piano – and enthusiastic, capacity crowds. “People feel that they are actually part of the music, and the performers sense the audience’s reactions, too, which can create a wonderful kind of energy,” said Mason. The next Mason Home Concert, coming up on Sunday, November 20th, will pair pieces by Mahler, Brahms, Schumann and Vaughn-Williams “in the style of a Parisian salon” with new short works by composers Conrad Freiburg and Kerrith Livengood. The afternoon’s performers will include oboist and horn player Zachary Pulse, violist Wade, and pianist White with international mezzo-soprano Jennifer Beattie. Reflecting on some of the series’ most memorable performances, Mason recalled a concert by the Amicus Trio, which includes cellist Itzkoff, violinist Marten, and pianist Melik-Adamyan. “They played an all-Mendelssohn program that was truly amazing, uplifting and energizing and people are still mentioning it to me,” said Mason. Amicus will return to the series in January with a Russian and Armenian program, featuring guest violinist Melody Chang (MM ’13, GCRT ’14). Other 2017 concerts will feature the Argus Quartet and the SAKURA cello quintet, which formed at USC Thornton and includes Kaufman, Jonathan Dormand (GCRT ’14), Yoshika Masuda (GCRT ’12), Peter Myers (MM ’10, GCRT ’13), and Sarah Rommel (GCRT ’14).